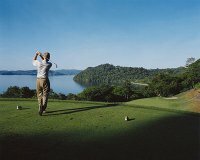 The Four Seasons Resort at Peninsula Papagayo is located at the tip of the Papagayo Peninsula, and offers astonishing views of two bays. With an impeccable service, casual seaside elegance and all the facilities you can think of, this hotel provides a new level of sophistication in Central America. Perfect for families, honeymoons, weddings, this luxurious resort includes a spa offering a complete range of treatments, a fitness center, a golf club with sweeping views of the Pacific Ocean on 14 of its 18 holes, a tennis court, three restaurants, an open air bar with live Latin music every night, day care, 3 swimming pools, children's swimming pool, Jacuzzi. The 145 generously sized rooms and suites of the Four Seasons Resort are imaginatively crafted with indigenous wood and stone finishes, and their special indoor comfort harmonizes with an outdoor furnished terrace or veranda that takes advantage the marvelous views. The decoration is inspired on the natural surroundings: ocean, forest, sunshine or beach. The extra-spacious and inviting marble bathrooms are cool, airy and feature deep soaking tub, separate glass-enclosed shower, large double vanity and – in a separate alcove – WC with telephone. Among the rooms amenities there are 100% cotton oversized bath towels, CD and DVD players, down pillows, duvets, hair dryer, in-room safe, Iron and ironing board, thick, terry bathrobes. The 145 generously sized rooms and suites of the Four Seasons Resort are imaginatively crafted with indigenous wood and stone finishes, and their special indoor comfort harmonizes with an outdoor furnished terrace or veranda that takes advantage the marvelous views.